Quotes By Category is a free Windows 8 quotes app available under ‘Entertainment’ section of Windows 8 app store. This quotes Windows 8 app brings you a wide collection of quotes in various categories such as Success quotes, Bible quotes, Famous quotes, Romantic quotes, and Nerdy quotes. As you open the app, you will find box that brings you quotes according to the category chosen. All the categories are given at the bottom. Well.. there are icons and you need to click on an icon to read quotes related to the selected category. As you select a category, the quotes will automatically switch to the new category. Now, in order to view more quotes in same category, just click on ‘Previous’ or ‘Next’ button. You can easily copy the quotes using the ‘Alt+A’ and ‘Alt+C’ button ? then paste it anywhere you want to. 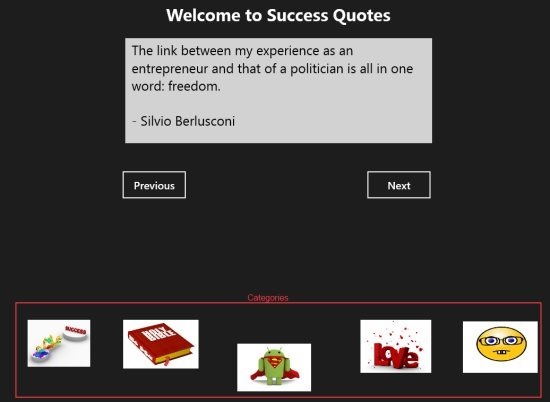 Let me quickly point the main features of this quotes app for Windows 8 below. Comes with a collection of thousands of different quotes in various categories. Categories such as Success, Bible, Famous, Romantic, and Nerdy are included. As you select a category, it automatically switches the quotes to the new selected category. Lets you copy quotes and paste it anywhere you want. Each category has a number of different quotes. Well.. I really liked this quotes Windows 8 app as it brings you quotes by category and you need to select a category to find related quotes.. it can be romantic love quote, inspirational success quotes, religious quotes, popular quotes, and the like. You can copy a quote and paste it to your Facebook wall or just Tweet it, thereby getting highest number of likes. Also, check out our posts on Quotes, Dictionary Apps, and Forismatic. Open this link in IE10 and click on ‘View in Windows Store’. This will open the app in Windows 8 app store from where you can install it. Download Quotes By Category app in Windows 8 now. In short, Quotes By Category is a good utility Windows 8 quotes app to get fresh quotes every day. Go ahead and download it now.